Ever wondered where your stuff is stored? What do 30,000 servers look like? Ever think about where your stuff is stored? Perhaps you use Dropbox. Or Mobile Me. Or Gmail or Hotmail. Although the talk is always of storing things "in the cloud", everything still has to be kept on a physical drive somewhere. And that storage produces a lot of heat, takes a lot power and needs an awful lot of processor cores. And then there's redundancy – if one server or even a whole data centre was to go down, there's always a backup. So we went to Germany to visit some of Europe's largest data centres, owned by web host 1&1. The company is huge – especially in its home country – delivering five billion non-spam emails a month and having 11 million domain names on its books. The company has 9.44 million paid-for contracts and 26.6 million free accounts. Just over a million of its customers are in the UK. It all started with just one Windows desktop PC in Karlsruhe, Germany and now the company has over 70,000 servers at several different data centres in Europe and the US. All have used green electricity since 2008. The first of two data centres we visited was at Baden Airpark, an ominous property at a former air force base that remains a monument to the Cold War (albeit one that's now a sparsely populated business park). The base was formerly occupied by French and Canadian air forces before it was finally closed in 1993, and the runway is now a small provincial airport, as demonstrated by the Ryanair planes flying in. The data centre building is a former engine workshop with huge two-foot thick metal doors. These house a giant airlock that you feel like you might never get out of. We climbed the stairs and entered one of the server rooms. The noise and heat hits you while the rows of strip lights flash on automatically. Each server is identified by its own QR code. There are occasional gaps or unconnected cables where servers need to be changed or repaired. Believe it or not, this whole facility is unmanned and any maintenance requests flash up at 1&1's control centre in Karlsruhe. Each room also has comprehensive power management and cabinets dedicated to keeping the temperature constant. 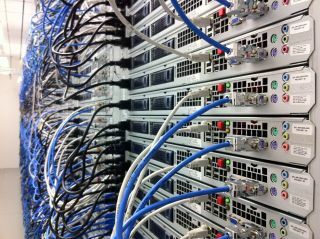 The Airpark building has 2,000 square metres of floorspace with 30,000 servers. There's nothing else here apart from the racks and a roof full of cooling equipment. The noise from the coolers is the only indication from outside that something sensitive lies within. There are a whole lotta cables, too. The servers are mostly systems sourced from a local manufacturer, but there are some HP and Dell units in certain cabinets. One large cabinet hosts the entire of 1&1's GMX email system. Current page: What do 30,000 servers look like?